Welcome to the Write Divas Featured Writing Prompts & Exercises! Often you hear “show, don’t tell,” but unless you’re in the midst of writing something descriptive, it might be hard to put that into practice. So, here at Write Divas, we decided to come up with the opportunity for you to show, show, show as much as you like without worrying about overflowing your manuscript with too many details. 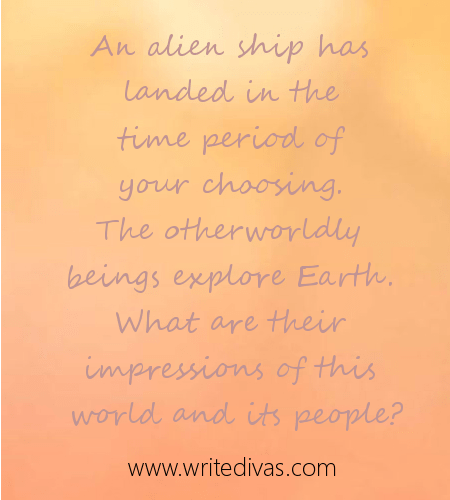 An alien ship has landed in the time period of your choosing. The otherworldly beings explore Earth. What are their impressions of this world and its people? Now—go! Describe using all your senses. Everything is new to your alien, so don’t hold anything back.